Fluffy Mexican Rice — Restaurant-Style! Holy bejeezus, I’ve figured out the holy grail of RICE, dudes. I don’t know where you come from, but where I come from, Mexican (and Tex-Mex) restaurants have the BEST rice in the world. I can only call it “Fluffy Mexican Rice”. It’s almost like Minute Rice with as fluffy and crumbly and soft as it is, but the grains still remain separate and it’s thick with garlic and onion and chickeny goodness. And lots of chicken fat or lard, probably – I can taste it in there. So, yes, this rice is way more calorically dense than plain rice, but it’s also way way way more delicious. And I know this is not what any self-respecting Mexican would call rice, but I’ve already covered that base. Round these parts (Texas) the true Mexican rice (sauteed dry, then cooked in stock) is often called Spanish rice. The restaurants serve this kind of rice, for whatever reason. Put the rice in a sieve, and put the sieve in a bowl of enough water to completely cover the rice. Let soak for 15 minutes then drain. Saute over medium heat the onion, celery, garlic and bay. Add the tomato paste and stir until the rice is coated with tomato paste and begins to look toasted – about a minute. Add the chicken broth and salt and pepper. Bring to boil, then reduce heat to simmer. Simmer 10 minutes and remove from heat but leave the lid on for another 5-15 minutes before serving. Ah, it’s a real staple in our house! We love Caribbean rice. Rice with black beans, with pigeon peas, with corn, with all manner of yummage. Try cooking with Goya’s sofrito or with achiote! I use just a spoonful of coconut oil, toss in some mango salsa, maybe cook it in unsweetened coconut milk, and boy howdy! You got every delicious violation of the health codes on your plate, ma’am! Ooh, yum! That sounds great! It’s been a long time since I’ve had pigeon peas. Do you find them dried or canned? I think I’ve only ever seen them canned here. I love the coconut milk idea. The best way to get them, because they take a long time to cook, is to buy them frozen if you can. But you can buy them canned or dried as well. We have a large Puerto Rican community, and pigeon peas and rice with roasted adobo pork is a Christmas tradition in many families. If you can buy recaito (a cilantro/lime/green pepper/garlic paste) you can make Arroz verde. As for the coconut rice, I just sort of stumbled upon the idea, based on Thai cooking and Caribbean cooking. If you coat the rice (jasmine) in the coconut oil and sort of fry it before adding the coconut milk, it adds even more flavor. I use a fresh made mango salsa that can be bought in the produce section of most grocery stores. Now, a question: Have you ever had or made Tres Leches cake? If you make it for Freakzone, you can call it Très Lecherous cake…pardon my French. Ha! That’s a great idea! I have made Tres Leches cake a couple of times. It’s been on the list for a while, but with that clever name it might actually get made now! I use frozen pigeon peas. They are much more tastier than canned. You should be able to find them in the frozen food section of most grocery stores in their ethnic food section. Have you tried it with Goya azafran ? I haven’t. I’m sure it would work, though! Looks amazingly delicious!! Can I give you one tip though? You can tell me to eff off. Instead of soaking the rice, fry it by itself in oil until golden brown. That’s how we Mexicanos do it anyway. That is what insures that the rice kernels remain seperate and fluffy. I believe that there is no right or wrong way to cook food if the results are good and yours looks very good indeed. And just as a side note, I love food and I want to die with a spoon in my mouth. I used to do it that way – that’s how my Mexicana friend taught me – but I don’t think that’s how the Tex-Mex places do it. At least, I haven’t ever gotten it super-fluffy with that method. Actually, I kind of suspect some places even use minute rice to get it that texture, but I have a moral issue with minute rice, so this is my fake minute rice. I also learned to make the rice by frying first (in bacon grease) then adding the other veggies which usually turns out good. By I will try the soaking rice 1st version to see what happens. Spanish rice has to go with the taco’s, chalupa’s etc… when you live in TX! I prefer the soaking I have tried both ways and when I fry the rice it always turns out sticky and not fluffy. from now on I will soak the rice. Do you have a recipe for refried beans? I’ve tried the,”toasting” the rice in oil method. My experiences have turned out sticky. The soaking method THEN toast in oil is “magic”! Then add the veggies and chicken stock. The original recipe I stumbled across required me to finish in a Dutch oven for 30-35 min. TOTALLY amazing! Victor how much oil and about how high heat would you fry the rice? That fork pic is the money shot. I did this with a can of mixed vegetables. Sooo good. Quick and easy. Not a big fan of Mexican food, but I will agree the rice is amazing. I always wondered how they got it to taste the way it is. Just not sure what to serve with it… Anyway, can’t wait to try it out. I did it with some steaks (thin ones you find, not with bones). I think it’ll go good with most meats. It would be great with any meat, or anything with some saucy goodness for it to soak up. I need the home made chicken stock recipe. Thanks! You just boil the bones and skin from a whole chicken for at least 5 hours. I boil mine all day. Then strain it through a sieve or a strainer lined with cheese-cloth. Secret tip for making chicken bone broth- use the carcas from a roasted chicken! About 10-15 minutes before finishing the stock add 2 T of vinegar- it pulls all the good gelatin and minerals from the bones and you won’t taste it at all! I also add a very generous amount of organic chopped parsley at this time. Another trick of mine is to add a quartered sweet potato and a large handful of fresh dill with the simmering bones for flavor and a nutritional punch! OMG…. you are so beautiful in this vid!!!!! We love you Hilah. Keep up the fantastic work. When cooking rice do you brown it at all? I assume you’re talking about just cooking plain rice here and if so, then, no, I don’t brown or toast it first. For just regular plain old rice, combine a cup of rice with two cups of water and a pinch of salt in a saucepot and cover with a tight lid. Bring to a boil over high heat, then reduce heat to simmer and cook 15 minutes. I’ve been putting together “Spanish Rice” for 40 years… We eat it most weeks..I’ve adopted various ingredients to enhance tastes, etc., but… the texture basically remained the same.. Good but not…well..just the way I wanted it.. This “soaking the rice” tip has lifted my Spanish Rice approval rating (from family and friends) by leaps and bounds..
Hi Ross! I’m so so happy to hear this helped you in your quest. I was ecstatic when I finally figured out the soaking trick. Really glad to hear other people are as excited as I am about it. I did it! Yeah! Good stuff! I’m from NM and moved to Missouri (Misery) and really miss New Mexican food. Mil Gracias – 1,000 Thanks! This is our new favorite recipe. I added green peppers from the garden and some leftover chicken, yum! Keep up the great tips. Thank you, Marj! Great idea you had to make it into a full meal with chicken. Glad you enjoyed it! Omg, I hadn’t made Mexican rice in so long – I tried this version and it was sooo good! I never would have thought to add a bay leaf to the rice. I might have over-salted it just a little, but the flavor was really good – reminded me of Rice-a-Roni, but better. I think the bay leaf really adds a lot, right? I love it. 🙂 Glad you enjoyed the recipe (with your own twist, of course!). THANK YOU!!!!!! I have been searching for this SECRET to fluffy rice for most of my life!!!!!! Made the Mexican rice last night with my pulled pork tacos. It was great! I love your website. The videos are a big help, since I am a visual learner. Thank you so much! Yay! Sounds like a fabulous combination, Mary! Thanks for writing. Great to hear, Greg! I bet the carrots added a nice flavor and even more color to the rice. 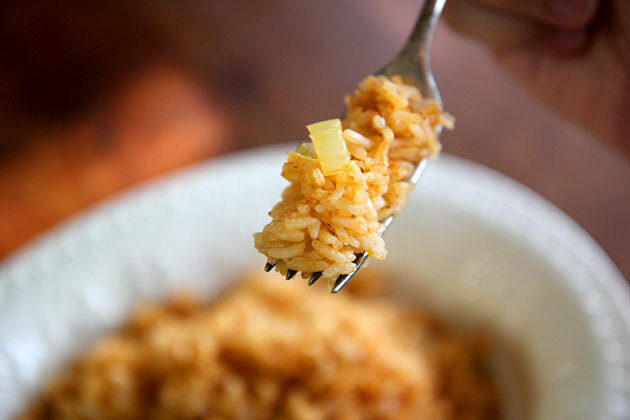 This looks wonderful an so easy, i tried making Mexican style rice today and i followed all the instructions but its still kinda mushy an moist, not fluffy:( the only difference my recipe did not use a sieve? do you think that made the difference? Yes it could have been that the rice wasn’t drained well enough before cooking, leaving too much water. I’ve never made rice this way before, but I will definitely be using this technique again! It was the fluffiest rice I’ve ever made, and it was still delicious even though I used water instead of broth. Made this tonight and I loved it! I’m also really bad at making rice for some reason, it never comes out just right, but this time it did! I’ve been trying to figure this rice out forever. Did this recipe and NAILED it. Thanks!!! Yay! Thanks for writing, Jennifer! I haven’t, Lauren, but let me know if it works! Most rice cookers make the rice mushy not fluffy like it should be…. Skillet method make the rice fantastic and fluffy. I also cut my tomato sauce by 1/2 just make up difference with chicken broth. This recipe is HORRIBLE. Doesn’t taste ANYTHING like Tex-Mex rice from a restaurant. Not even close!! I followed the instructions exactly and it’s simply not good. I can get much better rice from the local El Mariachi down the street and save money, time, and cleanup. Don’t waste your time. I lived in Texas for 10 years and I’ve never come across rice that was anywhere close to this stuff. Just nasty. Have fun at El Mariachi! I followed the recipe and while it tastes good, it is not fluffy like in the Mexican restaurants. I’ve tried at least five different recipes, each with different methods to get the rice really fluffy (soaking, browning, baking). The secret is very simple, if you want rice truly light and fluffy like you’ll find in the restaurants, use instant rice. I am trying out your recipe right now and I am keeling my fingers crossed that it comes out like the one in your video. I live in Santa Fe New Mexico and we love Spanish rice here. You will find it in all different styles, none of which ever use instant rice. There is a place called Rancho de Chimayo that I absolutely love their rice. I wish I could get their secret on how to make it because it is fluffy and flavorful. So the one tweek i did to your recipe is added some Azafran to the broth like a tea and strained it out, I am hoping that this will not only impart more color but perhaps some flavor. I wish I could send you a photo of my results. If you’re on facebook or twitter or instagram, send me a picture there! Best Spanish rice I’ve ever made! Thank you! I was lazy and didn’t want to wash an extra bowl so I soaked the rice in the pot *after* the sautéing and mixing everything together and it was wonderful! Also I’m a vegetarian so I used vegetable stock. I made this and it came out perfect! I used my electric pressure cooker and just changed the water to rice ratios. Saving this! Thank you!! Can you use jasmine rice? I think you could, it will taste different but should work. I subbed with a veggie “not chicken” broth, turned out great! Rinsing the rice is the trick. I read it on a few recipes & finally got to Confirm with yours – I was so happy that it turned out fluffy, not sticky. Thank you! And got some good ideas from your comment section too! There is no need to soak the rice in water for 15 minutes. Using any strainer, rinse the rice under hot water and squeeze the grain with hand to remove the starch. Removing the exterior starch render the rice not sticking upon cooking. They will cook individual fluff. Good ole fashion extra long grain rice. Add just enough oil to cover the bottom of your pan, let it get nice & warm. Then add just enough rice to also completely cover the bottom of your pan, no spaces showing. After browning, I start with 1 tablespoon of Knorr, 1/2 teaspoon of salt. (Season to your taste & pan size). Here’s what I’ve tried with water, first, use hot water & add enough to where it covers the rice by about 2-3 times over the rice. Bring it to a full rolling boil, stir a few times, not too much & keep a close eye on water level. If it looks like the grains are starting to fluff then turn heat to simmer & wait a full 20 minutes. It may come out a bit moist but that’s better than crunchy. If this still doesn’t work, then I’m convinced rice packers are mixing old & new rice. Happy cooking. I seriously had my doubts, it is one of those dishes that is simple, and should be easy but is not. I followed your recipe and have made it several times, it is amazing. Thank you so much!!! I would suggest adding a bit of cumin to make it more authentic, but truly amazing. That looks really good! I’ll have to try that sometime when I feel like cooking. Most of the time I just go to a restaurant, but I might want to try this sometime. I love the rice at my local Mexican restaurant and this looks just like it, so I’ll have to try it sometime.